There are some new items we have added to our store inventory this year, as well as some key items that your camper will not want to experience camp without! For the boys staying at camp longer than one week, camp provides a laundry service so the boys can get their clothes smelling good! Even the one week campers are going to want to a place to put their dirty clothes instead of sticking them back in the trunk with their clean ones. This laundry bag is mesh and breathable with a place for the boy’s name! Perfect for camp, it can also be useful for vacations and the college dorm room. Team Green! Team Gold! No matter what team your son is on, when it comes down to the Green and Gold competitions, he will be ready!! This shirt is a pre-order item only! It will not be in the Camp Store, but instead will be given out to the boys who ordered it by cabin. Which ever team their cabin ends up on, that is the shirt they will receive. 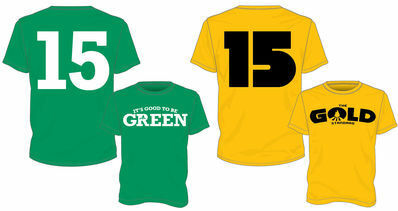 You do not have to order a team shirt, but can pack a green and gold shirt in their trunk! Just remember, they will not know what team they are on until opening day. 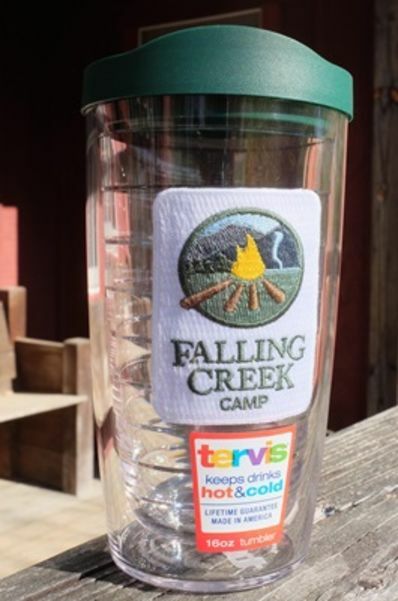 A brand new item this year, the Tervis is known for durability. 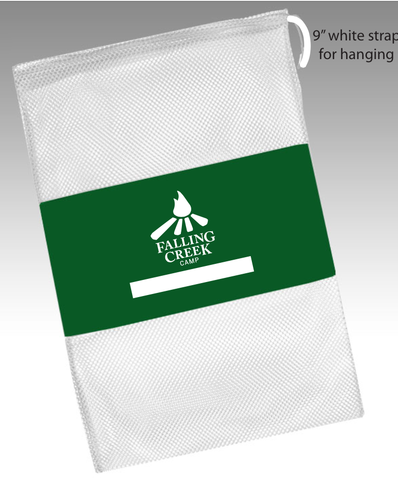 With our logo and the Falling Creek green lid, this item is great to travel with, use in the office, or at school! One camp item that all campers will want that will last them summer after summer is the Crazy Creek Chair. Not only does it have the Falling Creek Code on it, but this easy to carry and easy to pack chair is perfect for campfires and overnights! They are also awesome to have at home as well as athletic events and bleachers! This super comfy blanket is made out of sweatshirt material. It will become a new favorite blanket to have on the couch during family movie time and is stylish to show-off on the bed. It will also be very handy to have on those crisp summer nights at camp. This one is a definitely a camper favorite. After a Social Media contest through our Facebook and Instagram pages, this beautiful blue FCC neck tie and bow tie was voted on and won a spot in our store this summer! 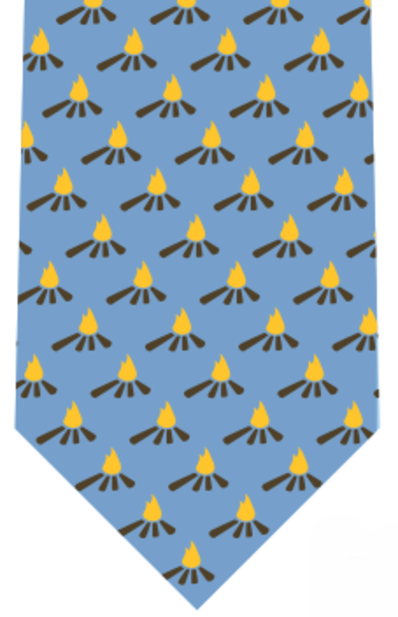 Created by Collard Greens, the tie is a light blue with the FCC logo imprinted on it. Since the boys will not need a tie during the summer time, it will only be for sale on closing days. What an awesome gift for dad, granddad, or your collegiate family member. All pre-orders are due on April 30! 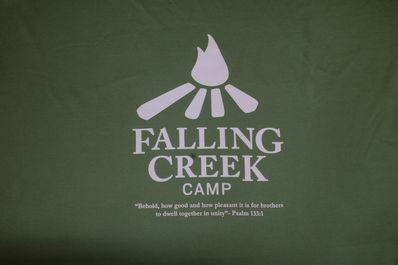 We have so many more items to look at on our “website!”http://www.fallingcreek.com/news/camp-store The pre-order forms are located in your CampInTouch account under the Forms and Documents section. By pre-ordering an item, you are guaranteed that item, so do not miss out on a camper favorite by waiting until the summer. Falling Creek Camp is in a unique place, nestled on the edge of the Appalachian Mountains, and surrounded by several amazing towns and cities. Here are some awesome things to do and places to see while you start to plan your drop-off and pick-up plans this summer. If your boy is at the one-week session, make a vacation out of it! Falling Creek is located in Tuxedo, NC, just south of Hendersonville. Hendersonville is a cool town with some wonderful restaurants, shops, and places to stay. The Flat Rock area in Henderson County is full of some awesome golf courses if you enjoy spending your day on the green. The Flat Rock Playhouse is a cute local theater with shows playing weekly and just down the road from them is the Carl Sandburg House with some wonderful hiking trails and tours of the historic home. My favorite recommendation is Downtown Hendersonville which is perfectly set-up for an evening stroll, dinner, and dessert at one of the many delicious local restaurants or make an afternoon out of it with shopping the many local shops. 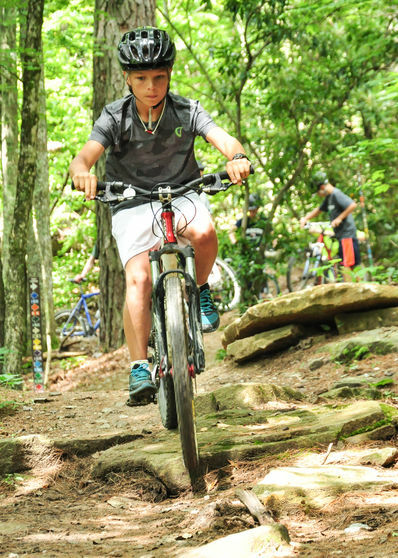 For places to stay, Hendersonville has several bed and breakfasts and hotels, but to point out some local favorites, the Mountain Lodge in Flat Rock gives 15% off to camp families. For a more elegant stay, the Highland Lake Inn is a gorgeous resort with the option to rent cottage, cabin-like rooms, or their hotel-like rooms. Another is the Orchard Inn which is a highly rated bed and breakfast. Your visit to Hendersonville is not complete without having breakfast at Flat Rock Bakery and lunch at Hubba Hubba! Brevard is in Transylvania County, located just west of Henderson County. With an easy 30 minute drive, you can quickly be stolling in downtown Brevard, eating the best ice cream you have ever tasted, or hiking some of the most beautiful trails found in Western North Carolina. 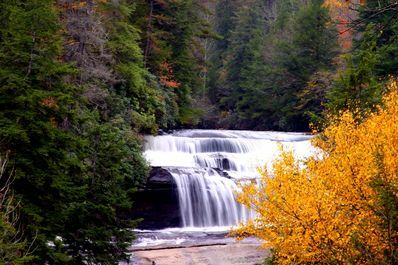 Whether you want a quick walk to a roaring waterfall or a nice 2-mile stroll through meandering trails overlooking some Appalachian valleys, Transylvania County is known as the land of waterfall and has two amazing state parks. Pisgah National Forest and Dupont State Forest will easily keep you busy for hours to days. If you like your adventure by car, then continue on Hwy 276 through Pisgah National Forest, and you will eventually enter the Blue Ridge Parkway which is well worth the drive. At the top of the Appalachians, you can drive the winding roads with many overlooks and hiking trails just off the road. And to make your trip beyond perfect, once at the top, make your way to the Pisgah Inn dinner and watch the sunset over the Blue Ridge Mountains. 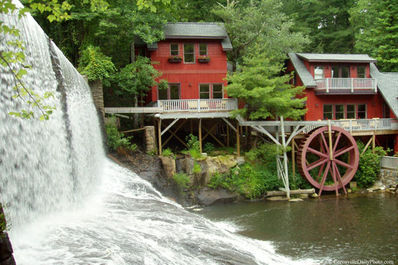 The Pisgah Inn is one of the most highly rated inns in the entire US. Transylvania County is known for its rivers, including the French Broad and the many forks that enter it. If you like to cast the line, this is the place to do it! Davidson Outfitters takes guided fishing trips daily! You will not be disappointed with their service whether you are a pro at fly-fishing or have never picked-up a rod before in your life! If you would rather stroll the rivers on your own, stop by and see them and they will be happy to direct you to the best rivers and holes. If you are not feeling adventurous, Downtown Brevard is packed with local shops, delicious cuisine, and a historical movie theater which is always playing current popular box-office movies. Interested in staying in Brevard? Do not overlook the Pisgah Inn. If you want to stay closer to town, the Red House Inn is practically in town. If you have not heard of Dollys Dairy Bar then this needs to make it to #1 on your priority list. They will have by-far the best ice-cream you have ever tasted. Two, highly rated restraunts in downtown are Falls Landing and Mayberrys. Asheville is north of Hendersonville and is a very popular place to visit. It’s unique, artsy feel, dozens of local breweries, delicious restaurants, and historical houses, it is so easy to make a vacation out of Asheville. 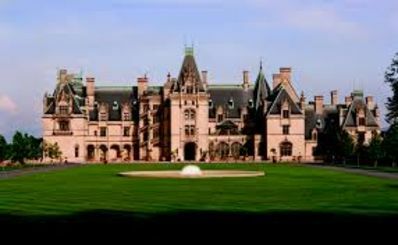 If you have never been to the Biltmore Estate it is time to make an extra day out of your visit to North Carolina. A tour of the historical home is just a small part of your visit. There is shopping, a winery, hiking, biking, fishing, horseback riding, etc. The list goes on forever. You can even stay at the Biltmore Inn right on the estate property. The Grove Park Inn and Spa is another beautiful place to stay in Asheville. If you want to relax, eat delicious food, and possibly hit a round of golf, this is the place to go! If you are looking for something fun to do with the kids, zip-lining is a great option. is the way to go! There are many awesome canopy tours in Asheville. With such a wide variety of local cuisine options in Asheville, it is so hard to pick the best, so I recommend that you investigate your options! There are many great restaurants from farm-to-table restaurants, breweries and cidaries, southern-style and the list goes on! For shopping, Downtown Asheville and Biltmore Park are full of amazing stores and restaurants. This list is just the beginning of what you can do while visiting Western North Carolina. For more information on local attractions, please visit our website and scroll down to the bottom of the page or give us a call. We would love for you to experience what we call home! If you have other recommendations, please add them in the comments below! With the weather getting warm and summer just around the corner, the upper lake is just calling out to the campers. It is the perfect time to take the cover off the pool, dust off the swim shorts, and dive into the crisp, cool water! 1. Jump feet first into water over the head, level off, and begin swimming. 3. Tread water for 5 minutes. 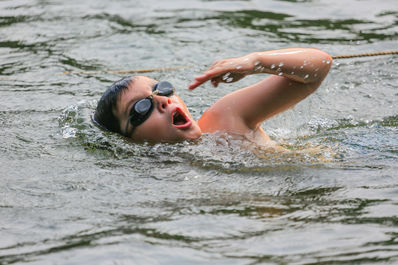 If a camper is classified as a Green Swimmer, he is are required to take swimming instruction as one of his six daily activities and is not eligible for out-of-camp sailing, paddling, and Sliding Rock trips. Green Swimmers are able to participate in lake canoeing and free swim activities in camp, wearing PFDs. Gold Swimmers are welcome to sign up for swimming as an activity period to improve their strokes, work on progressions, and have fun, but it is not a requirement. Now is the time to practice! Get in the water with your boy(s) and start swimming. Use this opportunity to spend quality time with the kids. Not familiar with the swim strokes? Check-out Swimming Techniques. They have great tutorials on the different strokes as well as learning techniques. Now is the time to get comfortable in the water, preforming these skills, so when the first day of camp comes, they are ready to dive in and reach for gold! How do I Know if my Boy is Ready for Camp? How do you know when you child is ready for camp? Some children are ready for camp during kindergarten, while others get to high school and still want to be close to or at home. 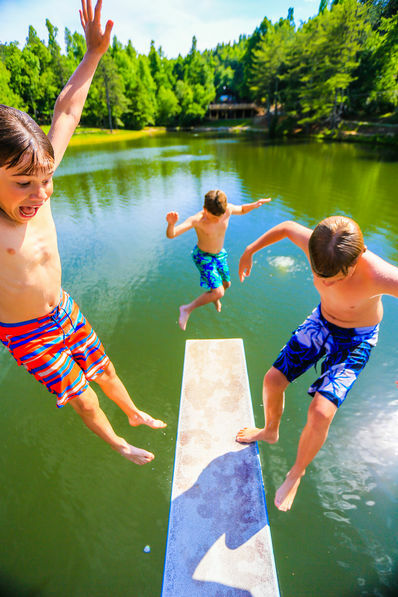 Many parents struggle with the idea of sending their child away for one, two, three, or even four weeks during the summer, not knowing if they are going to love it or hate it! Truth is most boys will have their bags packed and ready to head-off to camp while mom is still contemplating if they are ready to not have their little guy around for the next couple of weeks. So, how do you actually know if he is ready for camp? Well, if he can spend the night at a buddy’s house for a night, then he is ready! And if you can survive the night with him at his friend’s house, then believe it or not, you are ready too! Parents want so much for their kids. They want them to be happy, successful, and comfortable, make friends, have fun, get dirty, and stay safe! Camp will provide all of these things! They will make friends that last a lifetime. They will definitely have fun with many opportunities to be successful. They will get dirty, but will also shower daily! They will be in very safe hands with counselors trained for any situation plus nurses and a doctor living at camp! 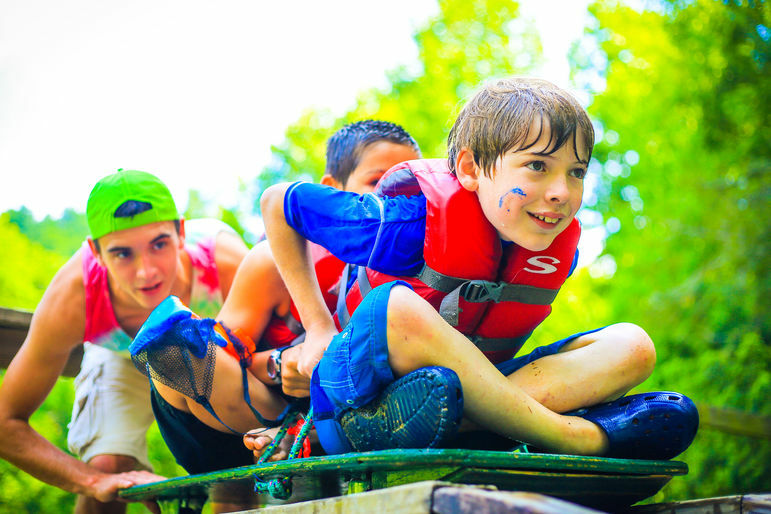 Between the good food, amazing activities they get to choose, loving and enthusiastic counselors, and constant surprises, the boys will definitely have fun! It is perfectly normal for a parent to feel a disconnect between their heart and their mind. The mind says everything is great while the heart worries. Sure, there is no prescription to cure homesickness, but when a boy is able to overcome homesickness, with the support of his counselors and friends, they do not only gain confidence, but a since of pride! We cannot promise that your child is going to have complete immunity from any form of homesickness, but we can say that the majority of boys who experience homesickness in the first few days of camp do overcome it and gain so much from it. They stay busy enough that most of the time they do not even think about it. And if they do, there is a major support team on hold ready to pick them up and give them the time of their life! So, is your boy ready for camp? Are you ready for your boy to go to camp? Junior camp still has availability is a perfect taste-tester for the camp scene. Or, maybe you want to wait one more year. Call us and schedule a tour for this summer, then you and your child can experience the camp scene and see if it is really time! Falling Creek has so many activities to choose from. 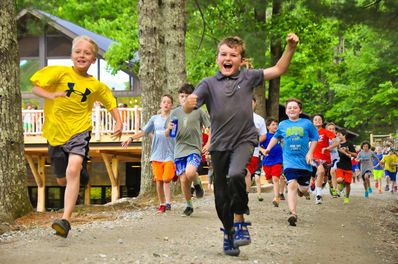 What is unique about our activities versus other camps is how we allow our boys to make their own decisions, their own schedule, and allow for changes to this schedule each week. We also offer several off-campus trips each day so they can choose to stay at Falling Creek or enjoy a trip to a river, mountain, or lake. 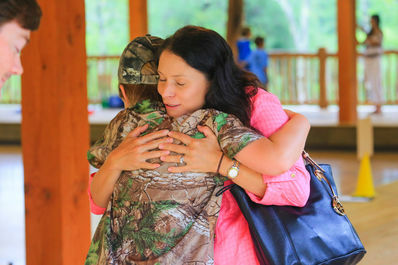 Falling Creek provides boys with something called special sign-ups. Like mentioned above, staff will announce what special trips will be leaving camp that morning and the boys can sign-up for anything they are interested in trying. Special sign-ups are not in our junior session, and the trips may vary between the other sessions, but trips can range from a half-day up to 5 days! Special sign-ups include backpacking/hiking, canoe camping, mountain biking, rock climbing, and whitewater paddling. These trips travel from the Pisgah National Forest, Dupont, Nantahala, and the Appalachian trial to Lake Fontana, and many rivers, like the Pigeon, Chattooga, Green River, and more! 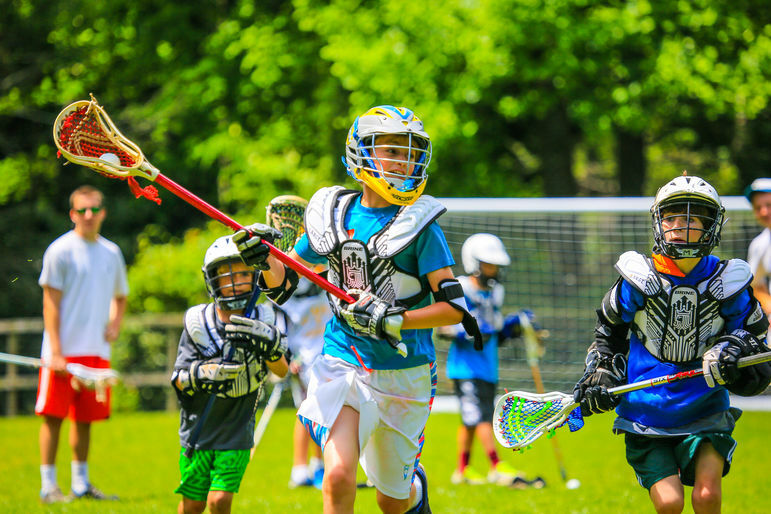 In camp activities range from water-based activities, like fishing, sailing, and swimming, to sports like, archery, basketball, cross country, flag football, lacrosse, riflery, soccer, tennis, the HEAT, and ultimate frisbee! 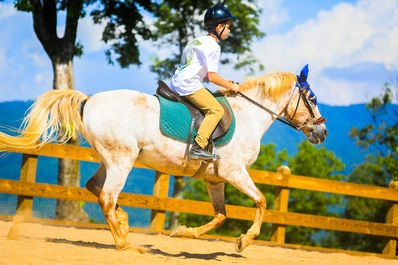 We also offer unique, traditional activities. These activities include; arts & crafts, blacksmithing, horseback riding, Indian Lore, music, nature, pottery, theater, and woodworking. 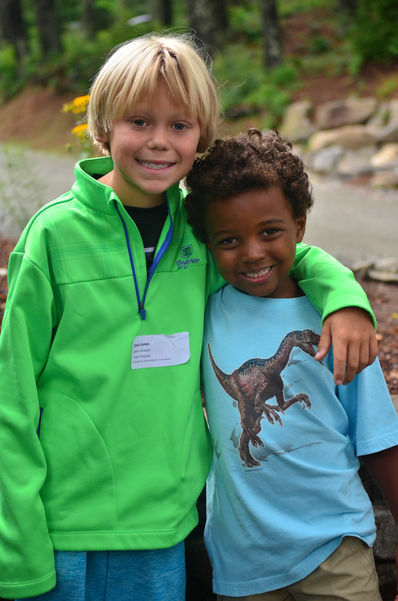 With so many choices for the boys to choose from, Falling Creek is always full of adventure, learning, and experience. What else is so cool about participating in these activities is we have a progression system for each activity where boys can advance through 5 levels from scout to warrior. Boys can take an activity even further by aiming to master an activity instead of just participate. For more information on the activities we offer or the progression system, please contact us at 828.692.0262.